Taking huge quantities of real meth can lead to all sorts of crazy adventures—including burning down the world's fifth-oldest tree. But the most likely side effect of taking the meth cooked up in Breaking Bad? A cavity. The drug was substituted for rock candy. 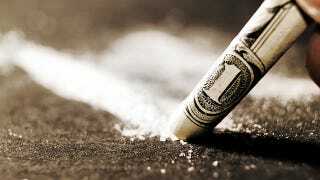 Of all the drugs floating around the streets, cocaine ought to be one of the easiest to fake. Still, legend has it that, during the filming of Scar Face, Al Pacino had to resort to the real stuff. Not so these days: in 2001′s Blow, the cast snorted inositol—powdered vitamin B. In indie film Half Nelson, prop artists took pieces from a broken mug and dyed them with coffee to replicate crack. Because those pieces don't really behave like the drug, they then had to use a little tobacco to create the associated smoke. All of which is, apparently, slightly less morish than the real thing.